A new Gigi coffee mug that is as sweet as she is! Part of our 'Answer is Yes!' Collection, this 16 oz Gigi mug will warm Gigi's heart like her favorite coffee or tea. 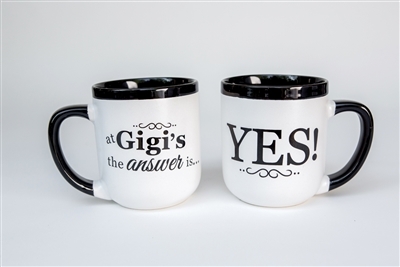 Our fun Gigi coffee mug is white with black accents and reads 'At Gigi's the Answer is... Yes!'. The perfect gift for Gigi from grand kids on any occasion, sentiment mugs come packaged in a white 5.5 x 4.5' box for safe shipping. Whether a new Gigi gift, or gift for Gigi's with years of experience, our mugs are sure to be filled and loved!